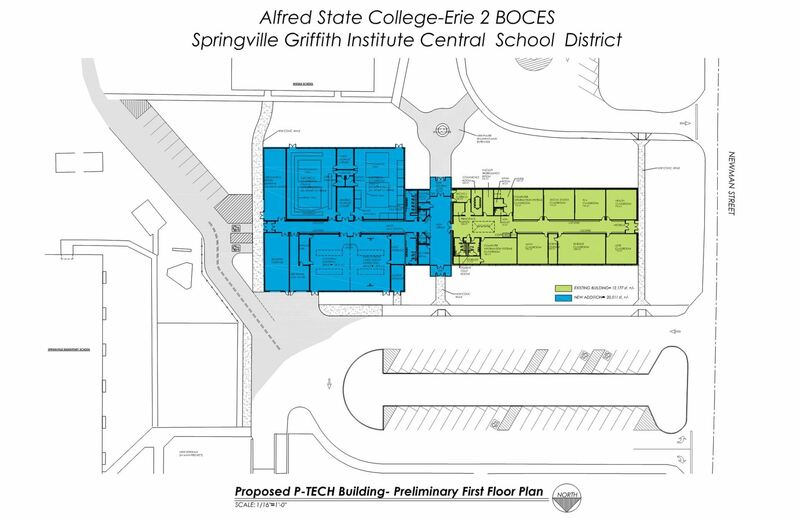 At our BOE meeting on Tuesday, May 1, we had our public presentation of Proposition #1, the BOE adopted budget for 2018-19, Proposition #2, the purchase of buses, and Prop #3 for a capital project to transform the District Office into the Alfred State, Erie 2 BOCES, Springville P-TECH Academy. District residents recently received a newsletter detailing all three of these propositions and I’ve written about the project here. When District Clerk Kathy Tucker was creating the newsletter, we grappled with how to include the architect’s drawings in the newsletter. I asked her to cut the drawings down so that residents could see the interior plan. What we lost was the view of how the planned project sits on the property. You can see that the transformed building does not impact our proximity to Newman Street or disrupt our SES playground or basketball court. The existing building is shown here in green with the new addition in blue–and we show more of a “plot plan” as one district resident requested. Please spread the word–I would be happy to come and meet with any group, formal or informal, to answer questions and further describe the project. I can be reached at 592-3230.